Tracy Weber is the author of the award-winning Downward Dog Mysteries series featuring yoga teacher Kate Davidson and her feisty German shepherd, Bella. Her first book, Murder Strikes a Pose won the Maxwell Award for Fiction and was 2015 Agatha award nominee for Best First Novel. The third book in her series, Karma’s a Killer, will released January, 2016 by Midnight Ink. Tracy and her husband live in Seattle with their challenging yet amazing German shepherd Tasha. When she’s not writing, Tracy spends her time teaching yoga, walking Tasha, and sipping Blackthorn cider at her favorite ale house. Her beautiful face, however, had been destroyed. Beaten so severely that Michael had been forced to identify her body based on a tattoo. According to Michael, Gabriella’s abusive ex-boyfriend never touched her face, even though he seemingly had no reservations about breaking the rest of her body. If he’s never damaged Gabriella’s face during her life, why would he do so now, in her death? On the other hand, if the murderer wasn’t her ex, why had Gabriella been beaten so severely? Didn’t obliterating a victim’s face connote rage? Was the killer destroying her beauty? Erasing her personhood? Acting in a frenzy of pure, unmodulated fury? I shuddered. Murder was never nonviolent, but this seemed exceptionally brutal. Life throws curve balls when you least expect it to. This motto, if you believe in karma, is gold. When you want something, but become desperate to find it—the worst scenario possible is all too likely. If you are not looking for anything, the best things in life can be life altering and quite beautiful. Weber has an entertaining mystery comedy that will rope readers in and leave them wanting to read more. Weber has Kate back into her sleuthing with this installment. There is a little bit of heartbreak too. When Michael asks Kate out to a fancy restaurant for her birthday, she thinks that he is going to pop the question. Her best friend, Rene, let it slip that she saw Michael exiting a jewelry store with a bag in hand. Of course, they both assumed that he was going to ask for her hand in marriage. It just couldn’t be anything else… Yet, when Michael pulls out a long, rectangular box that holds a beautiful locket, she is not only shocked, but bummed out. Then, Michael is forced to reveal his secrets after seeing how devastated Kate looks when thinking that their night was supposed to be a proposal. Kate’s ears ring and the betrayal comes rolling in when Michael says, “I am already married.” What can Kate do? It’s not what she thinks? Nothing ever is, right; isn’t that what they all say?! She accepts the request to go up to Seattle with Michael, find out what is going on, and settle the divorce in person. But, she needs backup from her best friend…her husband, twins, Bella and their newly adopted two puppies. Only, something goes terribly wrong. The separated wife is not willing to cooperate and then winds up dead on the beach, under a pile of driftwood. When Kate thinks that her life just couldn’t get any worse…yet another murder falling into her lap tops the cake. Weber has a superb story-line and exceptional character development. All of her characters have such depth that will intrigue the reader and allow them to feel emotions like sympathy and determination. This review is complimenting an advanced reader copy. The pace was absolutely terrific; it was fast-paced; however, there were several grammatical and spelling errors. Since this is an advanced reader copy, these may have been cleaned up upon further proofreading, but if not, this should not hinder enjoyment of the novel at all. If you are a reader of cozy mysteries and women’s fiction, you may want to pick this one up. Since this is the fifth installment in the Downward Dog Mystery series, it is advised to begin reading the first installment called Murder Strikes a Pose. There are some references made throughout the series that are easy to understand by reading these in order; however, this can be read as a standalone if desired. A copy of this book was provided to Turning Another Page by Loving the Book, but this in no way affects our honest opinion of the book or the review that has been written. We provide a five-star rating for Pre-Meditated Murder by Tracy Weber. 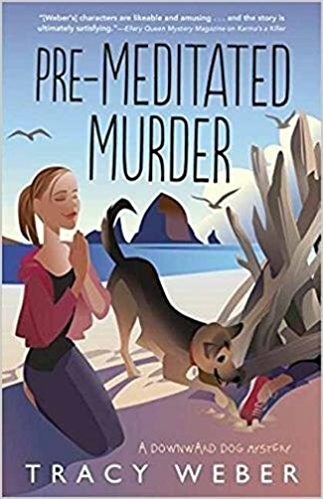 Pre- Meditated Murder is a lighthearted mystery starring yoga teacher/sleuth Kate Davidson, her best friend Rene, and love interest/pet food store owner Michael. Of course the true star of the series is a German shepherd named Bella, but I don’t know of any German shepherd movie stars, so I’ll leave her casting up to the director. As for Kate, she has a girl next-door energy. She’s pretty—though not drop-dead gorgeous—and she has a quirky, self-deprecating sense of humor. Amy Adams has a lovely, funny energy that she brings to her roles. She’d perfectly portray Kate and the embarrassing situations she finds herself in. Paul Rudd would be my choice for Michael. Like Michael, Mr. Rudd is handsome, but in a relaxed, everyman way. A bonus is that he looks great both with and without facial hair. My only concern about Paul Rudd is that Michael is six feet tall. Mr. Rudd will have to wear heels! Still, he is wonderful in comedic roles, and you can’t help but root for him. With Kate as a love interest, he’ll need all the help he can get! Rene is Kate’s drop-dead gorgeous best friend, sort of a brunette-haired Barbie. She has to be played by Olivia Wilde. I’ve loved Ms. Wilde since I watched her on House. I can imagine her being sophisticated, nuanced, and loyal, just like Rene. Patricia De Leon plays Gabriela, Michael’s secret spouse and the murder victim. Gabriela is a former model from Mexico who fled to the US to escape an abusive boyfriend. Kit Harrington is Von, who used to be Michael’s best friend. Von and Michael now have an uneasy relationship. Von resented Gabriela and how her relationship with Michael ended their friendship. Emily Rose is Shannon, Michael’s sister, who loves him to a fault and is prone to calling him “Baby Brother” every chance she gets. Elizabeth Moss is Crystal, Gabriella’s best friend. She, Von, Shannon, and Michael were all friends before Michael moved from Cannon Beach to Seattle.